For questions, comments, or concerns not addressed below, feel free to join and email the VoltAir discussion group, or dicuss online using #VoltAir (e.g. on StackOverflow or Twitter). How do I get started using VoltAir? Where can I find documentation on the VoltAir source code? How do I contribute to the VoltAir project? Is VoltAir still being developed? What platforms can I build and run VoltAir on? What versions of Android is VoltAir compatible with? What devices is VoltAir known to run on and why aren't more devices supported? Why did we choose to use C++? Why did we choose to use Qt and what is QtQuick? What is the high-level design of VoltAir? What is GameInput, why did you build it, and how do you use it? What is the VoltAir Renderer and what are some tricks behind the visuals? What is the VoltAir Engine, and is it really a game engine? How did you design the UI? If I want to develop my own new application based on the VoltAir source code, where do I start? How did you integrate Box2D / LiquidFun? How could I use the different particle types in LiquidFun and what other additional features could I add to VoltAir? Why aren't you using the Play Games Services C++ SDK? What's the deal with the sound files in the open source code? What workarounds did you need to implement? The Fun Propulsion Labs at Google are quite proud to announce that VoltAir, a casual single and local multiplayer game, is now available on the Google Play Store and as open source software. The game features a spunky, speedy robot stranded on an alien planet. Going as fast as his single wheel will carry him, he flies over ramps, zips around meteors, and rides geysers in his search for the portal that will take him home. VoltAir shows how versatile our LiquidFun tech can be when applied to a consumer application. LiquidFun is a C++ 2D physics library based on Box2D that includes high-performance particle simulation. It's used a few different ways in the game, as an obstacle for our little robot hero to work around, as a platform that lifts our hero to new heights, and simply as a way to add moving, splashing, graphic touches to levels. We built the game on top of QtQuick, which you can read more about below. You can download and play a working copy of VoltAir off of the Google Play Store or take a look at the introduction to our open source project to get started downloading, building, and running the project. To see our source code documentation, take a look at our API Reference. For information on working on the VoltAir project, please see our Contributing page. VoltAir was developed to provide an example of a C++ game designed for both Android and Android TV. For example, it shows on-screen controls when run on a mobile device, but does not show controls when on a TV. Additionally, VoltAir demonstrates controllers, local multiplayer in Android, and how to closely integrate LiquidFun. VoltAir was not developed to compete with existing platform games, to make money, to provide a full-length game, or to actively promote the use of Qt in making games. Not at this time, but have a look at our Contributing page for submitting back to the project. We've tested building VoltAir on Mac OS X and Ubuntu, targeted for running on Mac OS X, Ubuntu, and Android devices. Theoretically, with a bit of work, other platforms could be supported through the cross-platform nature of Qt and Qt Creator. VoltAir is known to run on Android 18+ and Android TV. VoltAir has been tested on Nexus 5, Nexus 7, Moto X by Motorola, Android TV, and some Samsung devices. Some devices are not supported because we did not optimize for all phones, and, as a result, the game would not perform well enough on them. We chose to develop in C++ because it has better performance than Java, more directly integrates with LiquidFun, and is more familiar to the game developer community. QtQuick is one of the many frameworks provided by the Qt Project. It is best described as a 2D scene graph with an accompanying renderer. You can build up a tree of items, each of which represents some aspect of the scene: graphics, physics, input, audio, data storage, etc. You can also define your own items by either subclassing QQuickItem (for items that have some graphical significance) or QObject (for items that are important for other uses). NOTE: QQuickItem is actually a subclass of QObject. The QtQuick framework provides only a very shallow hierarchy of QQuickItem subclasses. Instead, the prescribed way to instantiate the objects is to write the graph in QML, a markup language in which you can describe hierarchies of QQuickItems. Instead of providing a class hierarchy of QQuickItems, Qt provides a hierarchy of QML Items, of which there are hundreds. When you subclass from QQuickItem, you can register your class to become available in QML as well. You can also write a QML file that can then be instantiated as you would a single Item. 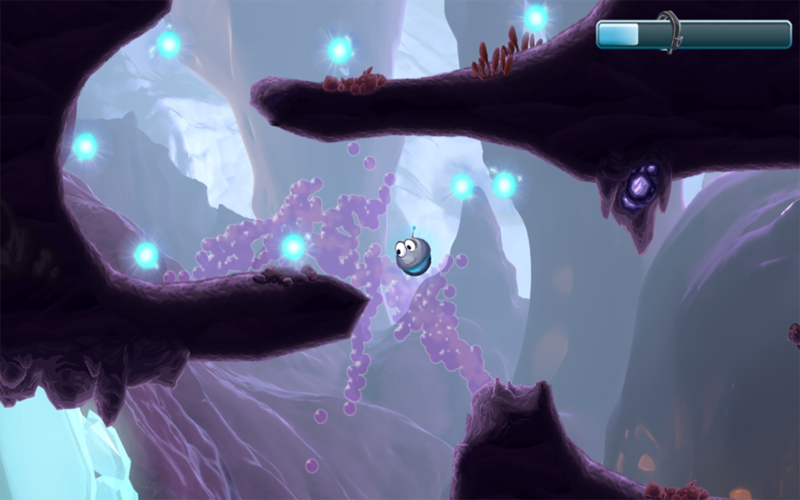 In the single player campaign, players navigate a "robot" through multiple levels using rolling on a surface and "magnetizing" towards "meteors" to collect energy balls in their path. There are liquids flowing throughout the levels that create obstacles and puzzles. For a gamepad, rolling is controlled via a left or right action on the joystick, dpad, or L2/R2 triggers. Magnetism is controlled via the A button or L1/R1 triggers. On other devices, such as keyboards or touch screens, these actions map to other logical inputs. Once a player has collected enough energy, a portal at the end of the level will open allowing them to advance to the next level. Google Play Games Services achievements are awarded during gameplay based on energy collection, speed, and other creative conditions. In the multiplayer arena, up to 4 players compete on a single device, possibly using different controllers or splitting a single keyboard. A player simply joins the game by sending any event from a previously paired input device. Gameplay is very similar to single player, however the multiplayer arena differs by being a fixed space in which the characters move with no explicit puzzles to solve, but rather a goal of collecting as many energy snowflakes as possible. These snowflakes, while having similar energy properties to the orbs in single player, differ in that they can be magnetically attracted to robots that are magnetized, making them a dynamic element in the game. In addition to the snowflakes being magnetic, players discover that robots, when magnetzied, also attract one another, and they can use this ability as a spoiler mechanic. 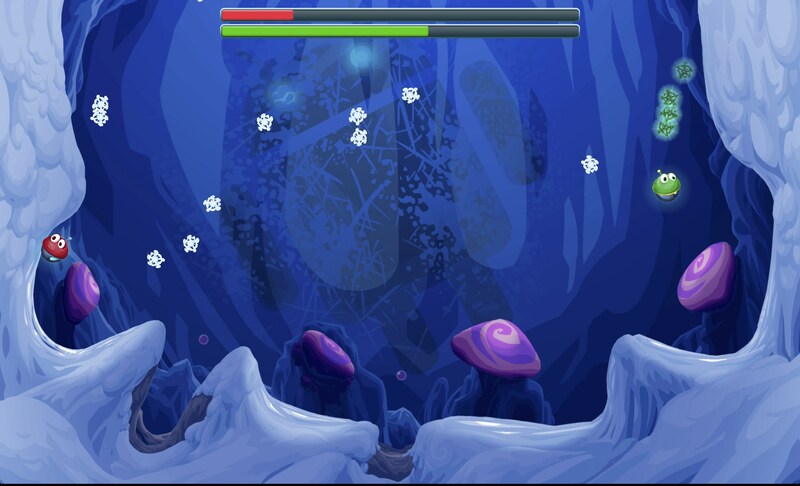 The arena also features several bumpers and liquids that players can use to accelerate towards the snowflakes, which are constantly flowing from the top of the screen. The player who collects a set number of snowflakes first is the winner. The Root node is itself very lightweight and serves as the starting point for scene traversal. It has input and UI managers as well as the Camera as children. The [Level] is the representation of a single level during gameplay. It is the part that is dynamically loaded and unloaded as the player advances from one level to the next. The Loader is used to asynchronously load levels into the scene graph since calls to QQmlComponent::create() blocked the UI and rendering thread, making the game become unresponsive during loads. For more information, see our workarounds section below. The InputArea is a module for gaining basic input event (i.e. keyboard) support on non-Android devices. See the details of GameInput below for more information. The Ui serves as a manager for all possible viewing states of the games overlay UI, including menus, splash or loading screens, and heads-up display (hud) information. The following diagram shows the layout of the main character in VoltAir, the Robot. We see its graphics have many states that can be animated (e.g. its magnetism's visibility can change, its eyes can move, etc.). The Body is a circle so it can roll. Its logics handle behavioral aspects such as its rolling, player-input directed forces, etc. To achieve support for different "controller" types (i.e. input devices which could logically be used to control the robot character) and multiple input sources, we implemented a separate input layer abstraction, GameInput, that could be re-used for handling controller input in a variety of controller-based applications. The need for such a system arose with the realization that Qt's event system based around QEvent did not support all desired controller types, nor did it support differentiation of input sources. Specifically, there does not currently exist a subclass of QEvent capable of representing real-valued axis events, and, instead, Qt's platform-dependent input handling delegates convert such input into QKeyEvents (e.g. on Android, holding right on a thumbstick would generate a "right" key event). Furthermore, QEvent lacks the fundamental concept of device ID, meaning all identical input events on different controllers are indistinguishable from one another, which would prevent local multiplayer support. Easily extensible to other controller "types"
Main, platform-independent module that defines logic for handling of input events, storing controller state, and defining controller input schemes. Intermediate, platform-dependent module for converting device-specific events into general platform-independent ControllerEvents and routing them to the appropriate InputRouter. 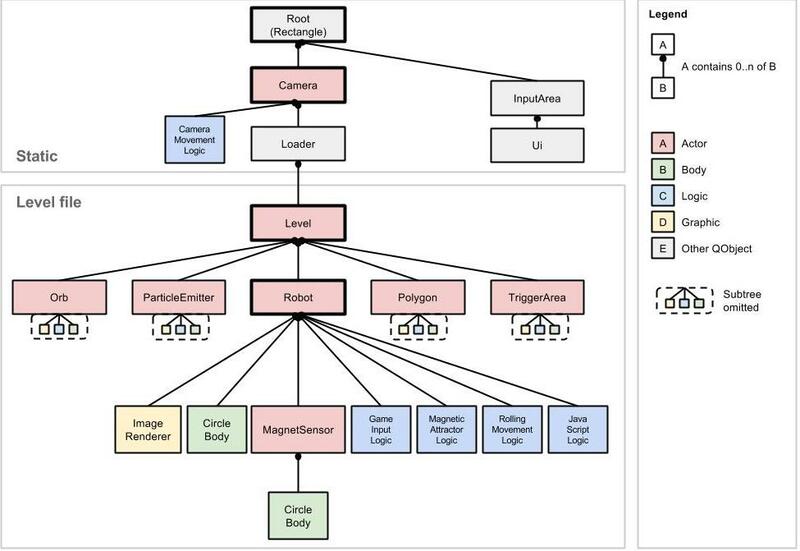 Application-dependent code that establishes how VirtualControllers are mapped to players, defines the canonical set of schemes mapping inputs to actions, and provides mechanisms for querying of the state of particular player actions. ControllerEvent A platform-independent event capable of representing input generated by any type of controller. VirtualController A representation of a physically-based controller (or part of one) with a unique device ID, 0 or 1 of each type of InputScheme, input capabilities that can be described by a ControllerEvent, support for handling events marked with the same device ID, storage of current state, and an ability to be queried current action value depending upon support (binary, unit value, symmetric unit value) for those actions. InputScheme A mapping from generic input "events" (e.g. key codes or trigger axes) to output "actions". ControllerFactory Interface for constructing VirtualControllers from a device ID. Factories encapsulate component InputSchemes that comprise a VirtualController and implicitly define controller "types" in the process. 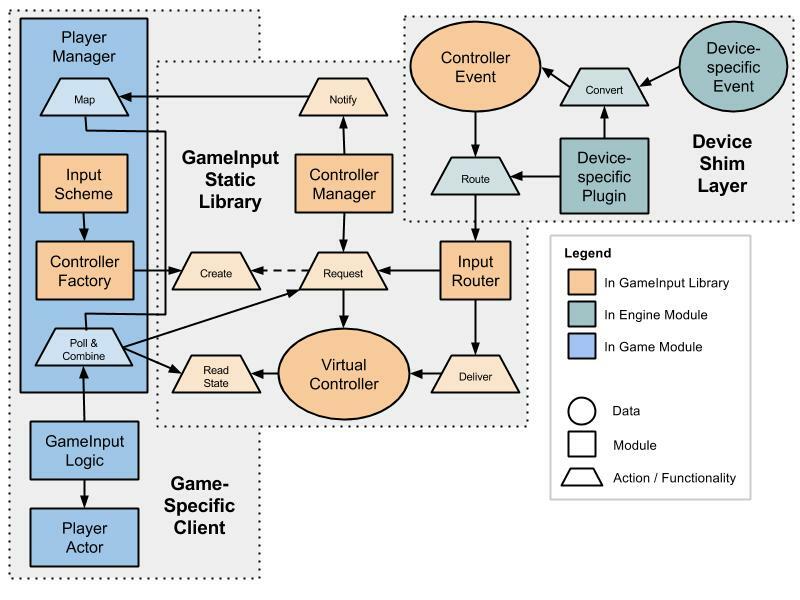 For example, the GamepadControllerFactory creates gamepad-related VirtualControllers with a specified KeyScheme, JoystickAxisScheme, and TriggerAxisScheme. InputRouter Routes ControllerEvents according to inherent ControllerFactory specifications. Specifically, the router creates an additional abstraction layer onto physical device IDs, allowing one physical device to be split into multiple VirtualControllers via different ControllerFactorys that contain non-intersecting input schemes. As a result, the "type" of InputRouter is defined implicitly by the ControllerFactorys that comprise it (e.g. GamepadRouter uses GamepadControllerFactorys). ControllerManager Manager to maintain a global list of connected controllers and notify registered listeners of changes in these connection statuses. VoltAirActivity / AndroidActivity Intercepts Android-specific input events (KeyEvents and MotionEvents) and converts them (via JNI) into ControllerEvents that are routed to the appropriate InputRouter according to Android-defined input sources (e.g. keyboard vs. gamepad vs. touch navigation). InputArea Intercepts Qt key input events (QKeyEvents) on non-Android platforms and converts them into ControllerEvents that are routed to the KeyboardRouter. PlayerManager Manager that establishes a mapping from unique player identifiers to different VirtualControllers that connect and disconnect throughout the game. Additionally, the manager abstracts away the different controller capabilities (i.e. different combinations of action support), instead defining and allowing the simple querying of relevant player values (e.g. horizontal motion or magnetized) through special methods. GameInputLogic Behavior that synchronously updates its parent Actor's player-related properties (e.g. horizontal input force and magnetized) each frame by polling the PlayerManager's reported state for the actor's player ID. VoltAirActivity intercepts the KeyEvent in dispatchKeyEvent(). AndroidActivity receives the KeyEvent via a native callback. AndroidActivity converts the KeyEvent into an associated ControllerEvent, maintaining the original device ID, and passes it off to the KeyboardRouter for handling. KeyboardRouter, having been initialized with a KeyboardControllerFactory whose KeyScheme mapped a left arrow key code to the "left" action, accepts the event for routing. KeyboardRouter then rewrites the ControllerEvent's device ID with a unique, fake device ID, and remembers the fake device ID used for the real deviceID and the matching KeyboardControllerFactory. Thus, in the future, UP-DOWN-RIGHT events from this keyboard can be mapped to the same VirtualController, but UP-DOWN-RIGHT events from another keyboard ord A-S-D events from the same keyboard can both be mapped to different VirtualControllers. KeyboardRouter then requests a VirtualController with the relevant fake device ID from the ControllerManager, providing the manager with a reference to the matching KeyboardControllerFactory. Having never seen the provided device ID before, the ControllerManager uses the provided factory to construct a new keyboard-related VirtualController and return a reference to it, but not before notifying all listeners that a controller with the fake device ID has connected. PlayerManager receives the connection notification and maps this fake device ID to the first available player ID. KeyboardRouter, now having a reference to a VirtualController, simply routes the ControllerEvent to it, causing it to update its internal state appropriate according to the KeyScheme from which it was constructed. This state can then be queried through methods defined in PlayerManager for the appropriate player ID. To achieve high enough performance in rendering of our game's scene (i.e. Actors such as terrain pieces, characters, and collectables), we implemented VoltAir's game-specific renderer, a simple 2D scene, OpenGL renderer, and use QtQuick's renderer exclusively for the UI. 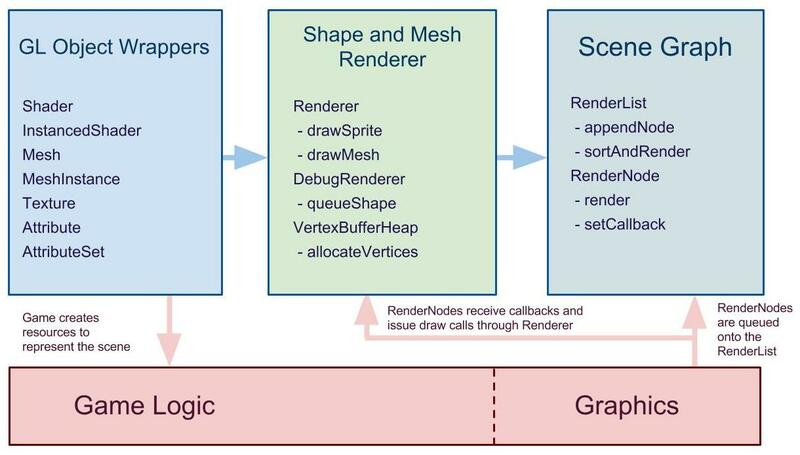 The main objective for this renderer is simplicity, as our initial investigations indicated our target devices can achieve sufficient fill rate to render scenes of our game's complexity, even with naive draw calls and structure. Much of QtQuick's slowness appears to instead be caused by significant CPU overhead processing geometry (e.g. to merge vertex batches) and the use of synchronous GL driver calls. The performance hit from this overhead is compounded by the fact that we use fluid simulations, which are also CPU heavy. One of the techniques we used to render the world was our terrain shader. This draws many of the larger pieces of ground and terrain throughout the game. To minimize the number of unique textures we had to create, it uses multi-texture blends to create variation, using up to three textures at a time. The geometry and texture coordinates for the terrain were precomputed based on the terrain's physical collision mesh (by our in-house level editor). These effects were chosen to help the particles blend in with the game world. As we developed the code, we made an effort to separate out the code that was not specific to the VoltAir game itself. This code is found in the Engine directory. For instance, Camera, Actor, Body, Logic, etc. are all defined in Engine, as is the main QML item for the game. By contrast, items and classes such as Asteroid, Orb, Snowflake, and Ui are defined elsewhere, as these are objects unique to VoltAir-specific. The VoltAir Engine can be thought of as a game engine in that it provides an infrastructure for building at least a certain class of games. A full game engine, however, is more robust than what the VoltAir Engine provides. One can consider it an engine only to the extent that its engine qualities can be factored out and used for games other than VoltAir. If one were to do this, though, they may quickly run into its limitations and find that additional functionality would need to be added. This is the top level "page" in the UI. All UI elements animate on and off of the display. This base component provides what is effectively an abstract API for this showing and hiding, as well as for managing input focus. This is an extension of the standard QML FocusScope that maintains and forwards focus intended specifically to support UI navigation using UP/DOWN/LEFT/RIGHT keys (or their equivalents). For each KeyNavFocusArea, you can define which other Item grabs focus when one of these keys is hit. Explained in terms of AndroidTV, this provides the creation of basic "Pano" navigation. Deep copy the entire repo. Rename the VoltAir directory and the VoltAir.pro file to reflect the name of your new game. Navigate into the Engine directory and perform a recursive, case-insensitive search for "voltair" to lead you to places where names must be changed. Familiarize yourself with the QML-defined actors in VoltAir/qml/actors. Notice how they each have Body items that define their physics behavior and Logic items that implement other behaviors. Familiarize yourself with the QML-defined levels in VoltAir/assets/levels. Note how they instantiate the actors you learned of earlier. Mimic the actors and levels to define your game. Swap out VoltAir's levels for your own in VoltAir/qml/VoltAirLevelProgressionList.qml. Once this is working, go back and rewrite the Ui item to use your own game's user interface. VoltAir/Engine/android/deploy/res/values/ids.xml: Play Games Services Achievement IDs. Box2D and LiquidFun form the backbone of our game's physics. 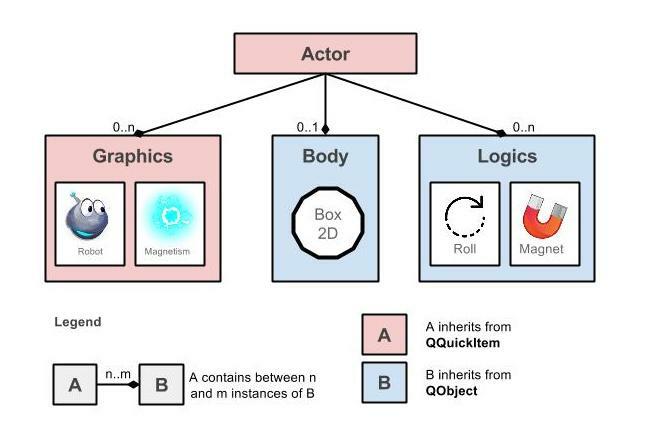 Each actor can have a physics body, which translates to a Box2D rigid body with fixtures. We have synchronization phases before and after stepping the Box2D world to keep things in lock-step. The same is true for LiquidFun. Particles are owned by emitters, and are synchronized at discrete points. For more information, see our wrapper Body, Joints, and Particle wrapper classes. To visualize these physics shapes, actors have associated graphics. These graphics, which can be anything from simple sprites to terrain pieces rendered using our terrain shader, are synchronized to their physics bodies by their actors during the synchronization phase. Particles on the otherhand are rendered all together using a single shader effect (with multiple passes). VoltAir only uses normal fluid particles. However, LiquidFun also supports rigid, elastic, powder, spring, tensile, and wall particles. Different ways to interact with the environment could come from experimenting with these different particle types. See the LiquidFun documentation for more information on how to use them. Exciting gameplay could also emerge from making magnetic actors that repel instead of attract. Or, instead of magnetism powers, give the robot a water powered jetpack to zoom around the level! Consider adding a second player to the single player campaign. Alternatively, give multiple players control of different parts of the robot and work together to finish the game! Try scripting and adding new Actor types and throwing them into the levels. The possibilities for this type of platformer are nearly endless! Our level editor was developed in Java and represents a separate, incompatible runtime. As a result, we chose not to release it because of the added additional complexity to the open-source project (i.e. we could not provide a high enough standard to release and support it). Google Play Games Native SDK can be found here. The API was not released in time for us to integrate it into VoltAir. Additionally, while in beta, the C++ SDK did not support cloud save. Instead, we decided to integrate Play Games Services and Analytics natively through our own custom JNI wrapper. Take a look at the code in AndroidActivity and SelfDetachingJNIEnv for examples and reusable boilerplate code of wrapping functionality that exists in Java and using it natively. Some of the sound files released in production are individually licensed to Google and could not be made open source. We replaced these sound effects with placeholder sounds in the open source code. In the process of implementing VoltAir on top of the QtQuick framework, we discovered a series of unrelated issues that needed to be worked around in order to make it viable as a game platform. See GameInput for more information. Out of the box, the performance of the QSGBatchRenderer for rendering large scenes was bottlenecking our CPU usage, and so we decided to write our own custom game renderer. See VoltAir Renderer for more information. Due to a known issue, we were restricted to 32 bit formats, which led to lower GPU performance. Qt continued renderering even when the app was backgrounded, causing errors in addition to battery performance issues. First, in order to respond to lifecycle events appropriately, we needed to install native callbacks (see AndroidActivity). Second, in the event that the application became backgrounded, we forced rendering to stop by hiding the QQuickView appropriately and informed all QQuickItems in the UI of the device pause event. Initially, we created our levels directly from QML data, using QQmlComponent to instantiate the level. However, this method resulted in a large blocking function call as QML data was parsed, objects were instantiated and initialized, and textures were loaded. Furthermore, since the rendering thread is synchronized in lock step with the UI thread, no animations could be played while the UI thread remained blocked, and thus the UI became unresponsive during even the smallest level loads. We enabled asynchronous loading of levels by using a Loader component in the QML scene graph, but this brought about additional issues. Most importantly, a bug in the loader sometimes causes an incorrect past level to be loaded, seemingly from data previously cached. The cached data causes our memory footprint to rise dramatically with each new level loaded, even after deleting the previous level, and possibly longer load times as we must try reloading until the desired level is finally initialized. Originally, we initialized our mesh vertex attribute data using explicitly written arrays of floats in QML, however, such an approach required excessive QVariant creation and copying, as well as significantly more text processing, during level load and initialization. Consequently, we switched over to encoding these large list of floats directly as binary data in base64, slashing our load times but reducing clarity in our level data files. The default implementation of the QMediaPlayer, while supporting looping, includes noticeable gaps during playback. This was addressed for Android devices by using JNI to instantiate and play a Java-based Android MediaPlayer, which itself required double buffering tricks to correctly get gapless playback. See SoundManager for more details. There are severe performance issues, even when caching the sound effect data, using mono WAV files for the sound effects on Mac instead of stereo. Hiccups in gameplay will be noticed on Mac as a result. We recommend using stereo sound effects when testing on Mac until the issue is resolved. QLists defined in C++ cannot be exposed to or modified from QML. In order to enable this, one must use the QQmlListProperty type, but it is cumbersome for typical use in C++. Since lists are a common data structure primitive used in games, we provide a utility class QQmlListPropertyOnQList to simplify exposing a QQmlListProperty backed by a QList. To address this, we have adopted a convention that each Actor when defined in QML declare property alias body so that body can be dynamically typed to the type of Body used by that Actor. By default, the AndroidManifest.xml generated by Qt leaves a replaceable macro %%INSERT_PERMISSIONS%% in order to dynamically insert relevant permissions needed by the application depending upon the set of Qt modules used. However, due to the broad functional nature of some of the modules, in particular multimedia, this led to VoltAir requesting permissions it did not need. To reduce user confusion, and keep permissions restricted to the narrowest, workable set, we removed this tag from the manifest and manually added back in the required permissions. As a result, one must be careful when using functionality that is already included in the Qt libraries used with VoltAir but for which our manifest may now lack the relevant permission (e.g. recording audio through QtMultimedia). There are several animated elements or sequences that can occur during VoltAir gameplay. However, using QML animation groups and timers to accomplish these effects results in the animated elements possibly running at a different rate from the game and, more importantly, makes them difficult to pause and resume along with the game. We address this by introducing the concept of "game time", advanced by each rendered frame of unpaused VoltAir gameplay, and by providing helpful primitives for using it in StopwatchLogic and AnimatedImageRenderer's useGameTime property. Transition animation groups written as part of an Item's transitions can be interrupted and stopped before completion if another transition occurs, rather than being completed in sequence or parallel with the newly triggered Transition. Specifically, if we have defined a transition from state A to state B and a transition from state B to state C, then the animations as part of the first Transition animation group will be triggered when the Item moves from state A to state B, however, if state is changed to C before this first animation group has completed, it will be preempted in favor of the second transition group. As a result, this can leave Items in odd, incompletely transitioned states – especially in the UI layer when transitions are often a function of user input. To combat this, we made our transition animation groups contain only relatively simple and quick function calls that kicked off "background" transition animations on other Items that would not be interrupted. More specifically, we introduced the fundamental UI building block in the UiComponent which can show or hide itself, reducing pressure on Ui, the main manager of all possible UI viewing states, getting stuck in an intermediate state due to responding to user input. Our custom game renderer needed to be compatible with both desktop and mobile clients, however, not all GPU architectures or desktop OpenGL versus mobile OpenGLES supported the same set of precision modifiers, requiring a compatibility prefix to share shader code between the platforms. Once no Images reference a particular source, the backing texture is freed. However, in VoltAir, these textures may get loaded again only moments later. For improved performance, we implemented a TextureManager as part of the VoltAir renderer for caching these textures. Since rendering occurs in a separate thread, GL resources like textures and vertex buffers must continue to be valid while the GPU is accessing them (i.e. until they have been flushed from the pipeline, for example through a call to glSwapBuffer), even after the level has been deleted. As a result, we must delay unloading of GL resources by a couple of frames. The UI, upon creation, needs to access managers, like TextureManager, which has yet to be created and initialized. As a result, we delayed creation of the Ui Item until after these dependencies had been initialized and then dynamically insert the UI into the scene graph.